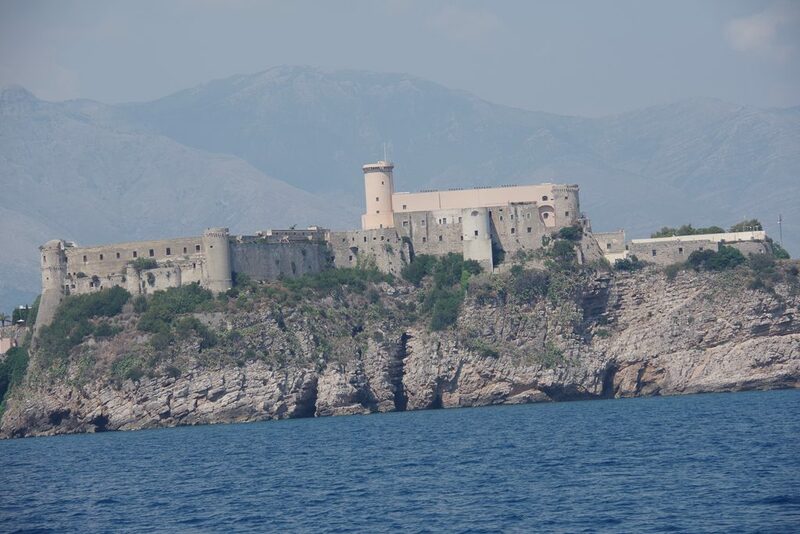 We left Gaeta, Italy on July 5th, after spending 19 days (June 16th to July 5th) at the “Base Nautica Flavio Gioia” Marina. It was both a wonderful town and a terrific marina. We had left our anchorage in Ponza on the morning of the 16th because we were concerned about a significant easterly storm that was predicted. The anchorage at Ponza is totally unprotected from the east and good protected anchorages are few and far between around here. 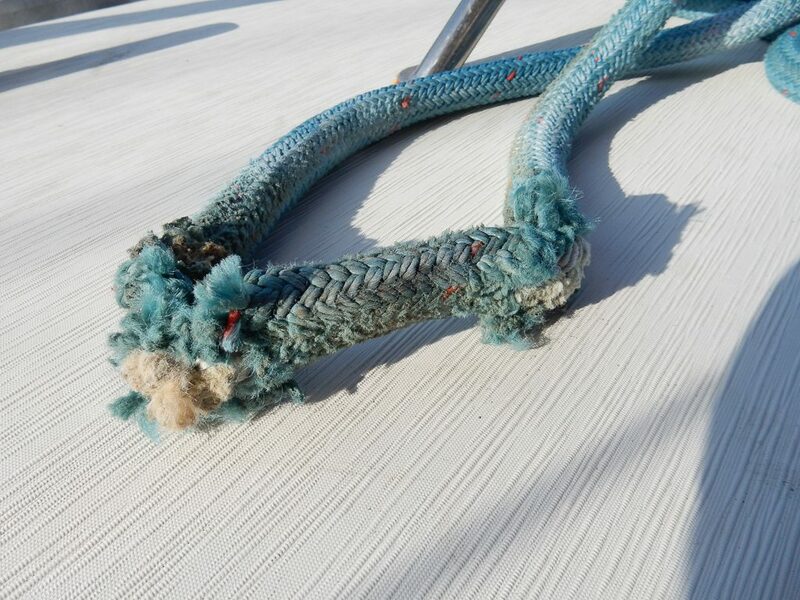 We also needed to get to a marina so that we could start the process of ordering and installing a replacement halyard for our destroyed main halyard. The marina in Gaeta promised very good protection from the east (and all other directions). However, when we arrived we were directed to one of the two seasonal floating docks that are set up just in summer (when easterly storms are supposed to be finished). The seasonal docks are not protected by a seawall (breakwater) but are open to the east. All of the berths behind the seawall were occupied. We were extra careful in how we tied the boat up knowing that she might get knocked about for a few hours. We moved the boat far from the dock using double bow mooring lines, and then backed down hard with the motor so that our stern dock lines would reach the steel bollards on the dock. The easterly storm was predicted to be short –two or three hours of strong wind – not long enough to kick up a large surge. The prediction was wrong. Once the wind came up after 2 am early Sunday morning the wind howled for 12 hours and the wind generated surge made Sabbatical III bounce up and down so hard that it was impossible for us to put down our passerelle in order to get off the boat, and extremely uncomfortable onboard. We, along with the other boats on our dock were getting bounced up and down quite violently (and all of the boats were much bigger than ours) and we were afraid that our dock lines, or those of our neighbors would snap. The surge would push Sabbatical III violently towards the dock, making the dock lines sag, and then pull it violently away, making the dock lines snap against the steel bollards to which they were tied. The whole boat would shutter from the jolt. Just watching the enormous forces making the dock lines sag and snap back every 10 seconds made us wonder how much abuse they could take. If one or both snapped, Sabbatical III would likely come hard against a concrete dock or our neighbor. It was such a strange experience because just thirty meters away from our dock the marina has a lovely bar and garden area (on solid land, not on a dock) and there were a few dozen people there, sunbathing, drinking, and having a lovely afternoon while we were getting battered around on the boat. By evening, however, the winds died down. Mark inspected our dock lines and one had frayed to the point that it would probably not have lasted another hour. (See photo of our dockline after the storm). The neighboring boat’s lines were in even worse shape. The marina said that they had never experienced a worse late season storm in their 50 years of operation. We had to replace our dock lines the next day as they were nearly chewed through. We were relieved to see that our neighbors did the same thing as their lines were also frayed to the core. After the storm, we really enjoyed everything about both the marina and the town. There is a very helpful and friendly American born woman who works for the marina (Jayne Koehler). She was of great assistance to us in arranging things, particularly in finding a good rigger to help us replace our snapped mainsail halyard. Within a few days of our arrival Luigi (the rigger) arrived at our boat along with Jayne (to help with any translation problems). Luigi’s English was great, however, and Mark ordered new halyards for both the mainsail and the genoa. We then had a couple of weeks to wait for them to arrive and for Luigi to make time in his schedule to do the work. We were also thrilled to learn through Jayne that we could get our propane cooking tanks filled in Gaeta. We had not been able to fill our tanks anywhere in Italy and had two completely empty propane tanks onboard, plus one with an unknown amount in it. We were afraid to use it up and had been relying on a cheap plug in electric burner for our limited cooking (good excuse for eating at restaurants all the time). Jayne even drove us and the tanks over to the station to get the tanks filled. 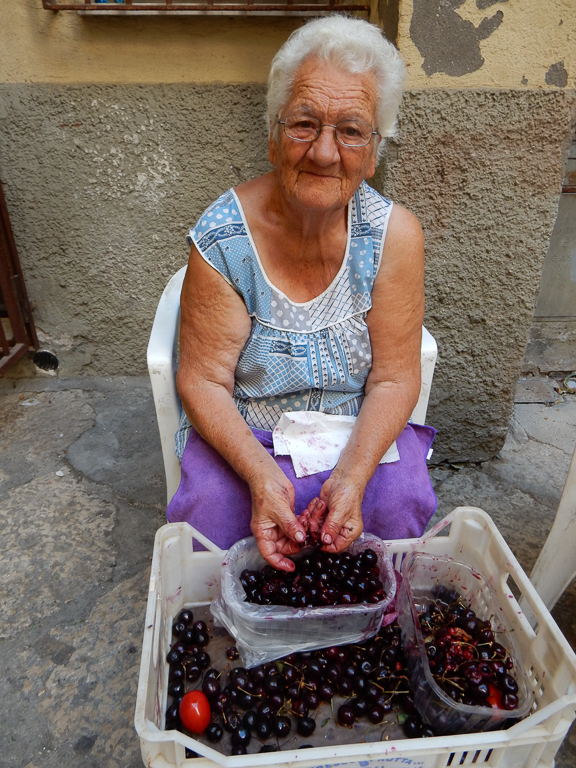 Gaeta is probably one of the only places in Italy that can (and will) refill US propane tanks. This is because it was long the home port of the US 6th Fleet and was home to 4000 US Navy personnel. The US Navy personnel in Gaeta came with their BBQs and other propane appliances and the town’s propane supplier acquired the hardware to service them. The US Navy is mostly gone now (shifted to Naples), although the flagship of the Sixth Fleet is still homeported in Gaeta. The marina is run by a brother and sister (Luca and Anna) who are super welcoming and friendly. On our second night in Gaeta we were excited to learn that Rod Heikell and his partner Lucinda were passing through the area and would be staying at the marina. Rod and Lucinda (Lu) are extremely famous among cruisers as they have written “the” cruising guides/ pilot books for all of the countries in the Med. Rod has been cruising the waters of Turkey, Greece, France, Italy, Spain and Portugal (others?) for nearly 40 years and everyone uses the Heikell books as reference. If sailors in the Med wanted to tell sailing friends where they were anchored recently, they might say “the place on page 354 of Heikell” or something of the sort. We were invited to an informal sundowner party at the marina to meet Rod and Lu. It was a lot of fun and we found them both to be very low-key, fun people. 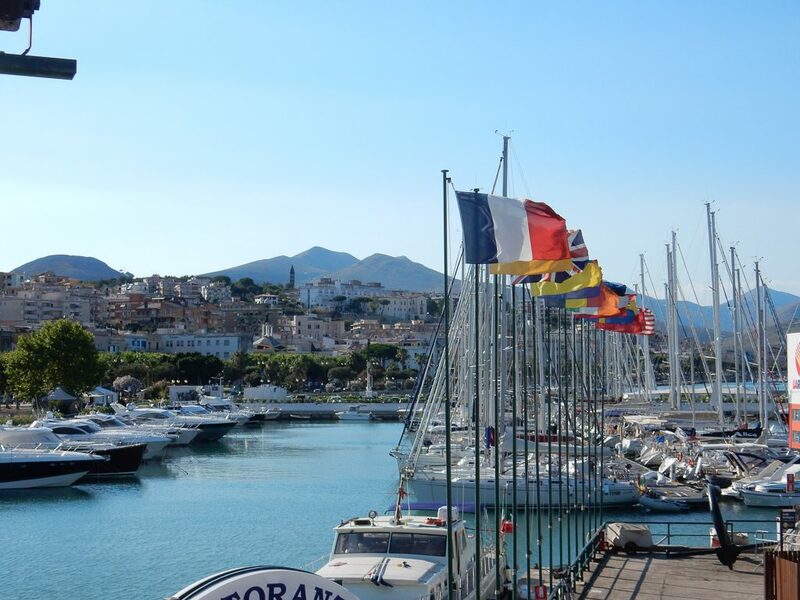 The marina is situated nicely with easy access to strollable seaside quays that stretch both north and south for miles. We found one great seafood restaurant one kilometer north of the marina (Comeilmare) and another, more upscale restaurant about 2 km south (La Salute), so we always had a great destination point for our evening walks. If we wanted a closer-by cheap place to eat, there was the Pizzeria Rustica just across the street. The line often goes out the door but it goes quickly as all of the pizza is pre-made. There are at least a dozen varieties and the men behind the counter cut off any size hunk of as many pizza varieties as you want and pile onto a paper tray. One pays by weight. Cheap and delicious. Just a block away from the marina there is Via del Independenza which is an absolutely charming old street with numerous fruit and vegetable shops, bakeries, butchers, and other useful shops. The nearest fruiteria was owned and run by Victoria (see photo) and her family. It is not really a store, just a little alleyway under a stone archway with crates of fresh fruits and vegies. Daily shopping expeditions were really fun. The town is also well known for its amazing fresh buffalo mozzarella cheese, which has become one of my favorite things in the world (add perfect Italian tomatoes, a touch of basil and a drop of olive oil). There is also a medieval part of town, just a fifteen minute walk away which has a huge fort and a very picturesque church, in addition to lots and lots of cute restaurants. Gaeta also has a gorgeous beach that we enjoyed a few times during our stay. It’s a fifteen minute walk from the marina. The beach is at least a mile long with beautiful sand and dozens of beach clubs where everyone rents an umbrella and chairs. We estimated that there must have been more than 1,000 umbrellas on the beach! 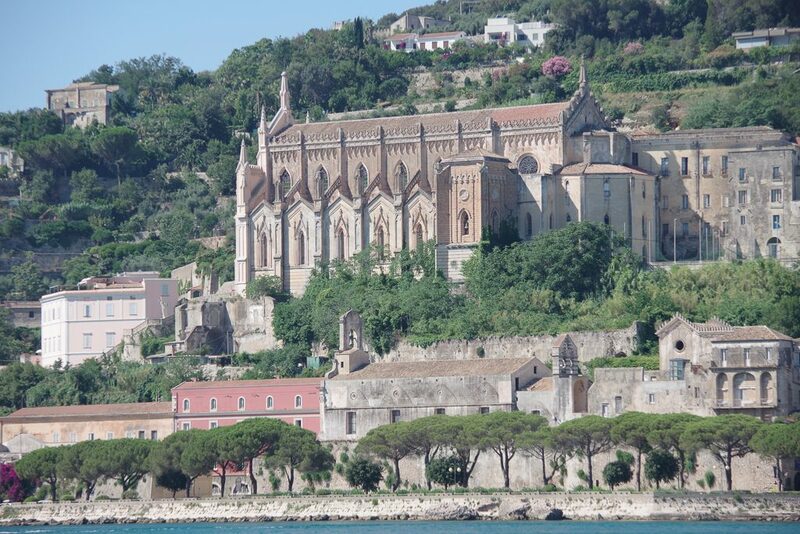 Gaeta is a great place to while away a few weeks. In addition to being a delightful town in its own right, it is located about half-way between Rome and Pompeii and it is relatively easy and quick to take a train to both places (which we of course did). The trip to Pompeii involved switching trains in Naples which was kind of a shock to us….we have not been in a big Italian city for a long time, and we felt a bit like country bumpkins as we worked our way through the huge crowds at the Naples train station. We were re-directed incorrectly at least 3 times by various officials at the train station as we tried to find the train to Pompeii. We finally gave up and bought new tickets on what was clearly the most direct and most popular train there. We planned our trip to Pompeii so that we would arrive a little bit late in the day and thereby hopefully miss the big tourist crowds. It was still pretty crowded when we started our tour there (self-guided using Rick Stieve’s app) and super hot. By 5:00 p.m. though the crowds thinned out a bit, the temperatures cooled and we enjoyed wandering about the ancient ruins for another few hours. It was amazing how many Americans were there. Taking the train to Rome was a piece of cake by comparison. There is a terrific bus pass that we bought in Gaeta (the B.I.R.G. pass for 14 euros) which covered all the costs of the bus from Gaeta to the train station in nearby Formia, the train to and from Rome, plus any buses or trams or trains we wanted to take within Rome itself. Trains run pretty much every hour between Formia and Rome, and the trip is roughly an hour and a half long. 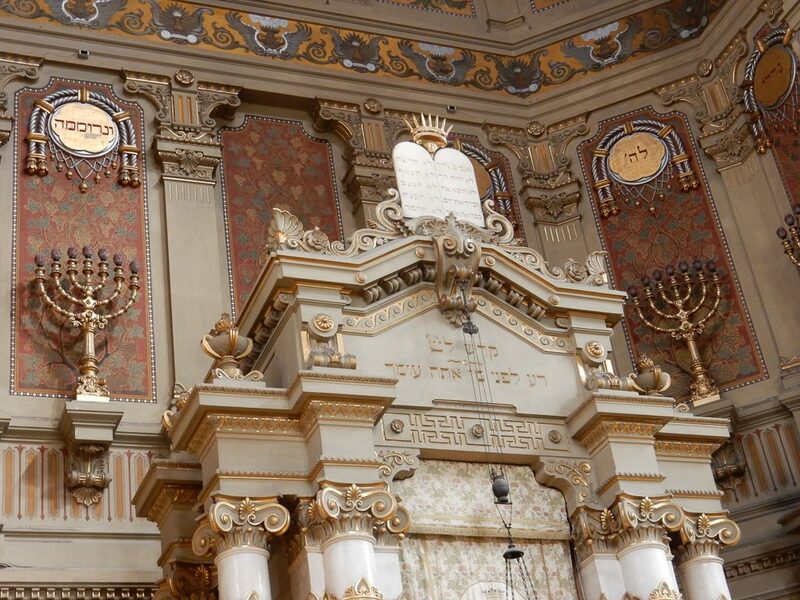 We spent a busy day in Rome with lots of time at the Jewish museum and beautiful old synagogue, plus a visit to the Pantheon, and several of the famous piazzas. Lots of tourists of course. It was a lot of fun and we were exhausted when we got back to the boat about midnight. After two weeks in Gaeta the riggers were ready with our new halyards. Luigi and his co-worker spent a full 2.5 hours on the boat, with most of the time spent at the top of the mast. We do nearly all of our boat repairs ourselves, but this was one time when we were more than happy to pay someone else to do the hard work. We plan to replace the rest of the halyards on the boat (we have 7 in all), but that is a job that we can do ourselves at our leisure. We met another American couple on a sailboat while in Gaeta (Robert and Christina from S/V Quest) and had a few social evenings with them and Jayne. Jayne even managed to arrange a 4th of July party which was attended by about 25 sailors, about half of them Americans. 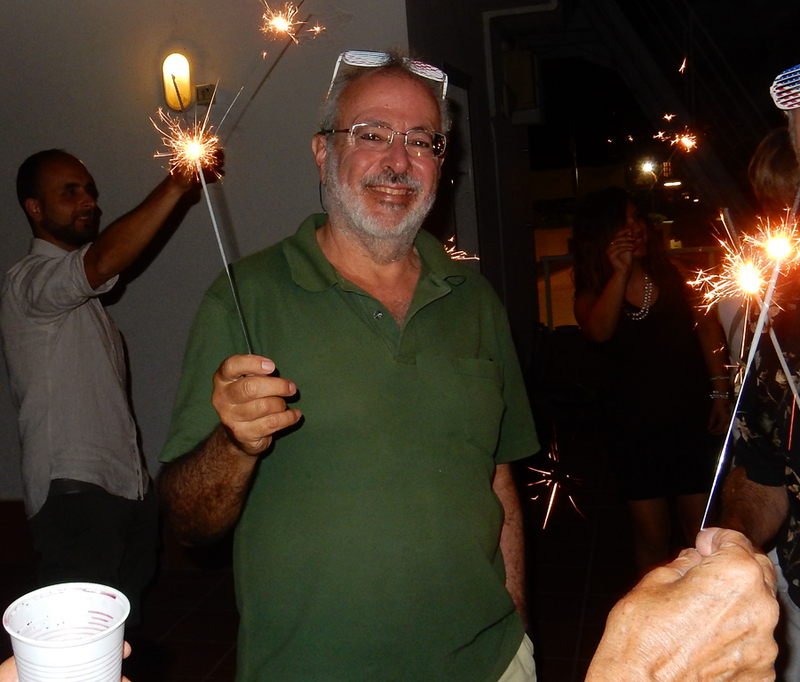 Lots of pizza from Pizzeria Rustica (the best pizza ever), lots of wine and beer, and even sparklers. 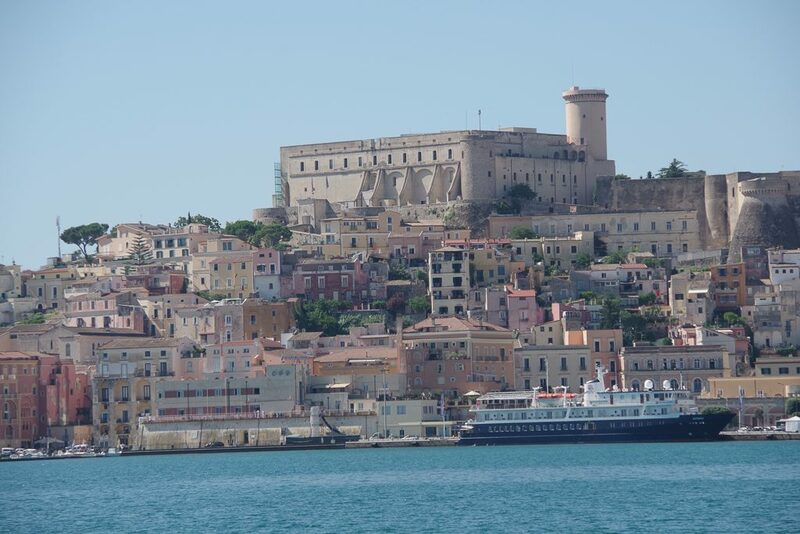 It was tempting to just stay on in Gaeta and would recommend it highly as a destination to both cruisers and tourists. We even met an American couple who used to sail, but when they got too old they sold their boat and now live in Gaeta full time, renting an apartment in the old part of town.